Federal inspectors are inside every meat and poultry processing plant in this country. The problem is, their efforts sometimes fail to identify salmonella — a potentially deadly pathogen that sickens more than a million Americans each year, about 200,000 from contaminated poultry. The five cases detailed below offer a window into why. Each example represents a multi-state salmonella outbreak linked to chicken or turkey. In each case, government officials were able to trace contaminated poultry back to specific processing plants. But in all five cases, routine testing in the six months before people began falling sick didn’t detect signs of salmonella problems that could lead to outbreaks. 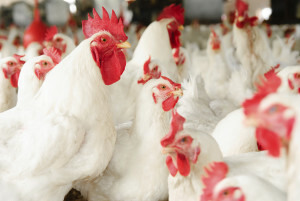 One explanation can be found in the way inspectors with the U.S. Department of Agriculture’s Food Safety and Inspection Service (FSIS) oversee poultry. When it comes to salmonella, the FSIS tests fewer than one bird per day in plants that can process up to hundreds of thousands of birds per day. And even when they do test, inspectors aren’t measuring the amount of the bacteria or the type found. Some poultry products aren’t tested at all. Take the example of Foster Farms, the largest poultry producer on the West Coast. From March 2013 to July 2014, a salmonella outbreak linked to three of the company’s processing plants sickened 634 people. But testing of whole chickens in each of these plants prior to the outbreak turned up no positive tests for salmonella. 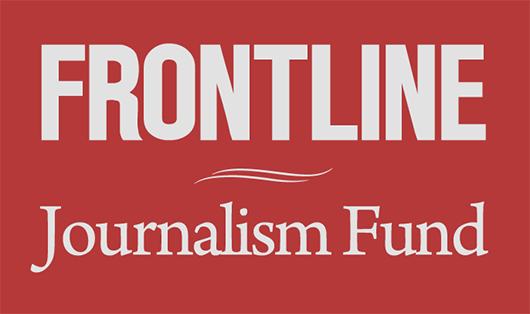 That’s according to an analysis by FRONTLINE and the Investigative Reporting Workshop based on USDA data obtained by BuzzFeed News through a Freedom of Information Act request. 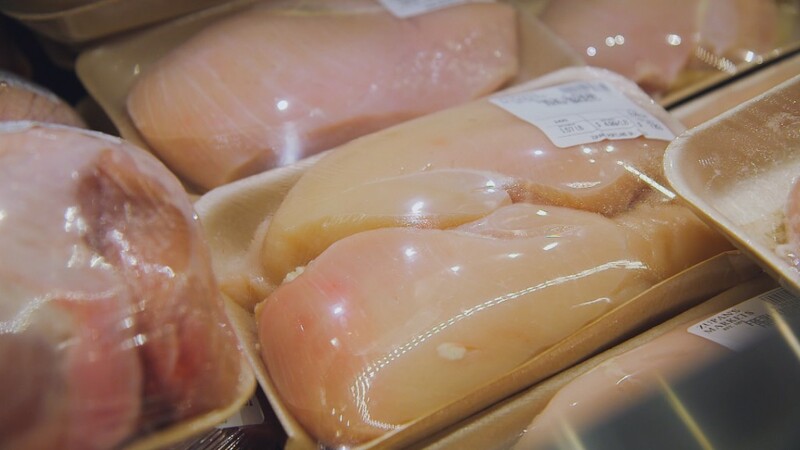 In their investigation of the outbreak, officials at the FSIS and the Centers for Disease Control and Prevention learned that most of those sickened had eaten chicken sold as parts — breasts, wings or thighs. That discovery highlighted another gap in the nation’s food safety system — chicken parts weren’t subject to salmonella limits. Earlier this year, FSIS proposed limits on chicken parts for the first time. Other times, inspectors did find salmonella ahead of an outbreak, but the amount they found was allowed under existing federal standards. So even though a company’s product was making people sick, they weren’t in violation of the FSIS limits. Ultimately, the contamination problems in each of the five cases were found and fixed, but only after consumers were sickened, some severely, from salmonella poisoning. An FSIS spokesperson said in a statement to FRONTLINE that the agency has been making changes to its testing and inspection system to try to catch more problems. FSIS now schedules intensive investigations, known as Food Safety Assessments, which are conducted by specially trained employees, at any plant that has a high number of food safety non-compliances or that fails to meet an Agency-established performance standard. The agency’s central, automated data system has made it possible to detect these developments and to act quickly to address them. Following the two recalls for ground poultry products in 2011, FSIS conducted investigations at the plants involved and publicly shared its findings from the investigations. FSIS also conducted special investigations at all ground poultry processing facilities and instructed ground poultry plants to update their food safety plans to address the weaknesses identified. The agency now tests all poultry plants continuously, taking samples every week on a random day so that companies cannot predict when the samples will be taken. Previously, FSIS conducted sample sets for 51 consecutive days, and companies that performed well could have gaps between each set (poor performers were tested more frequently). The agency is now testing poultry parts in addition to whole carcasses. New performance standards will be implemented this year that are expected to prevent 50,000 illnesses annually. Performance standards have proven to be effective at lowering Salmonella rates on whole carcasses. By developing additional standards, and strengthening existing ones, we believe that outbreaks will be averted.